Dr. B. R. Ambedkar was popularly known as Babasaheb Ambedkar and everyone knows that he was one of the architects of the Indian Constitution. He was a very well-known political leader, eminent jurist, Buddhist activist, philosopher, anthropologist, historian, orator, writer, economist, scholar and editor, too. Dr. Ambedkar fought to eradicate the social evils like untouchability and for the rights of the dalits and other socially backward classes throughout his life. Dr. Ambedkar was appointed as India's first Law Minister in the Cabinet of Jawaharlal Nehru. He was posthumously awarded the Bharat Ratna, India's highest civilian honour in 1990. 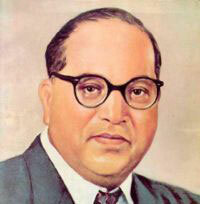 Bhimrao Ambedkar was born on 14 April 1891 in Madhya Pradesh. He was the fourteenth child of his parents. Ambedkar's father Ramji was a Subedar in the Indian Army and posted at Mhow cantonment, MP. Ambedkar had to face severe discriminations from every corner of the society as his parents hailed from the Hindu Mahar caste. Mahar cast was viewed as "untouchable" by the upper class. The discrimination and humiliation haunted Ambedkar even at the Army school, run by British government. Discrimination followed wherever he went. In 1908, Ambedkar went to study at the Elphinstone College, Mumbai. Ambedkar obtained a scholarship of twenty five rupees a month from the Gayakwad ruler of Baroda, Sayaji Rao III. He graduated in Political Science and Economics from the Bombay University in 1912. Ambedkar went to USA for higher studies. After coming back from US, Ambedkar was appointed as the Defence secretary to the King of Baroda. He had to face the humiliation for being an 'Untouchable' even at Baroda. To continue his further studies, in 1920 he went to England at his own expenses. He was awarded honour of D.Sc. by the London University. On 8 June, 1927, he was awarded a Doctorate by the University of Columbia. After returning to India, Bhimrao Ambedkar observed that cast discrimination was almost fragmenting the Nation so he decided to fight against it. Ambedkar favoured the concept of providing reservations for Dalits and other religious communities.Ambedkar, in wake of reaching to the people and making them understand the drawbacks of the prevailing social evils, launched a newspaper called "Mooknayaka" (leader of the silent). Once after hearing his speech at a rally, Shahu IV, an influential ruler of Kolhapur dined with the leader. This incident had created a huge uproar in the socio-political arena of the country. Ambedkar strongly believed that education should be provided to all sections of the society. B. R. Ambedkar Open University was established by an act of Andhra Pradesh State legislature on 26th August 1982. Well known director Jabbar Patel directed a movie on Ambedkar's life and teachings in English which was later dubbed in Hindi and other Indian languages. Since 1954-55 Ambedkar was suffering from serious health problems including diabetes and weak eyesight. On 6 December, 1956 he died at his home in Delhi. Dr. Ambedkar's name remains a sign of victory of the down-trodden and long-exploited.